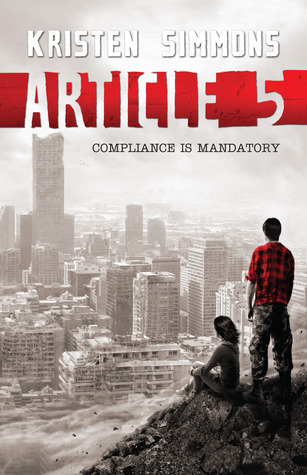 Article 5 was a whole lot of romance and a just a tiny little bit of dystopia. Ember Miller's mother gets arrested for noncompliance with Article 5 of the Moral Statutes: "Children are considered valid citizens only when conceived by a married man and wife." Ember herself gets taken into rehabilitation for being an invalid child. The soldier that arrests them just so happens to be Chase Jennings- the only boy Ember has ever loved. It's nice to see that Ember actually improved in her character by the end of the novel. She was dependent, weak, annoying and so naive it hurt. The initial burst of bravery she had trying to find her mother fizzled out when she was with Chase. There were times when she didn't seem to understand the idea of self-preservation. Chase was just trying to help you and keep you alive, Ember. Quit getting pissed at him because it's not like you were that great at taking care of yourself. That sounds like a lot faults, doesn't it? But she does improve, a little tiny bit. And like I said, it was a whole lot of romance. It was stifling almost but it wasn't half-bad either, albeit very angsty. I give her some credit because the main characters' chemistry wasn't borne from thin air. They had a history- of being best friends, of first loves, but circumstances made them hate each other. Then it was all about the journey of relearning each other and rekindling the chemistry. It was an entertaining read. What annoyed me though was the fact that I have no clue how this world came about. I don't know why the Bill of Rights was replaced with the Moral Statutes came about. I don't know why the government started sending people to rehabilitation centres. How did things get so bad that food and provisions need to be rationed? Why did the government ban literature and media? There was a mention of War that destroyed most of USA. It lasted at least three years. The results were severe, destructive and a lot of people died. Simmons did do well in establishing the now but no bothered to say what the cause of the War actually was, who was on the other side of it, anything. The cause is just as important as the effect. This really wasn't as bad as I probably made it sound. But if you're in search for a dystopia, there are better books out there.